The Sciton BBL is medical grade, which in the hands of an experienced practitioner, maximises both your results and safety. Kathleen has been using the Sciton BBL over the last 10 years, and is the Australian Clinical Trainer for the Sciton/BBL system for Ionia Medical (Australia). Kathleen commenced her training in Palo Alto, Silicon Valley, CA, U.S.A, 10 years ago, and has attended additional advanced training with Dr Patrick Bitter Jr, MD, in Los Gatos, California (a renowned dermatologist in the U.S.A). In fact BBL is Kathleen’s passion, its safe, effective & works. Treated patients generally see improvements in the discoloration of the skin due to our beautiful Australian sun, skin tone is more even, redness reduced & luminosity increased. The downtime is minimal (although some people swell for 2-7 days post treatment), the skin remains intact though ans makeup can be applied immediately post treatment & worn throughout the recovery period. There are many options for laser/light based treatments available today, many of them don’t do much other than empty your bank account. BBL is the one treatment I trust to consistently yield a great result. Bearing this in mind though, I will only treat your skin if I believe it will be a favourable outcome right from the start. There are many factors to consider with each skin, we can discuss these together to find the right option for you. If I don’t think BBL is right for you I will happily point you in the right direction elsewhere. You will find I am very open and honest (refreshing now days really), with my patients best interest at heart at all times. 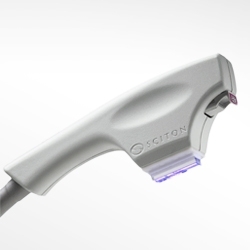 Sciton BBL offers a multitude of wavelengths between 420nm-695nm: the wavelength, fluence (energy level), and pulse durations are carefully selected to suit your skin and particular concerns. The light energy absorbs into the unwanted targets in your skin, such as: freckles, redness, capillaries, pimples, fine lines, enlarged pores, and hair (in the case of hair reduction treatment). More than one wavelength, along with multiple passes, may be used during your treatment sessions, to target each concern & maximise your benefit. A unique precision thermoelectric sapphire cooling tip aids comfort and protects the skin surface. Each pulse is delivered with Sciton’s square waveform technology, giving you an even treatment. BBL can help even out skin tone and stimulate the skin like you have never seen before, we usually recommend a series of treatments during your consultation. Risks, benefits, aftercare, costing, and further details can be discussed during your consultation. Kathleen will do her best to fit treatments and homecare into your routine and lifestyle, giving you a fresher, healthy appearance, with minimal (if any) downtime.